Outstanding opportunity to own a completely custom renovated four bedroom home. Over 2800 square feet of living space on a bright and sunny 60 x 130 foot western exposed lot. Quality is evident as soon as you walk through the solid walnut front door of the home. Stunning views of the private backyard are the backdrop for an open concept main floor plan. Gorgeous walnut flooring runs seamlessly throughout the home. The home's large custom kitchen built by Braam's Custom Cabinet's is modern, practical and esthetically pleasing. A mudroom with heated floors off the kitchen, acts as a catch-all between the garage and kitchen for dropping bags, boots and coats on busy days. The large main floor den set off from the main living area offers privacy for a home office, library or den. Upstairs, there are four spacious bedrooms with all the comforts. The stunning master bedroom features wonderful views of the backyard, walnut flooring, and is equipped with a gas fireplace for cozy evenings. A gorgeous ensuite is decked out with a soaker tub, glass enclosed shower, heated floors, and topped with a crystal chandelier for an elegant ambiance. A second bedroom also features a private ensuite with glass enclosed shower and marble flooring. Bedrooms three and four offer loads of natural light, spacious closets and hardwood flooring. The home's lower level features high quality wool carpeting, large recreation room, powder room, and exercise room complete with rubber flooring. Loads of trees and shrubs offer a private backyard retreat. Perfect for a family gathering or summer BBQ. Move in and enjoy! 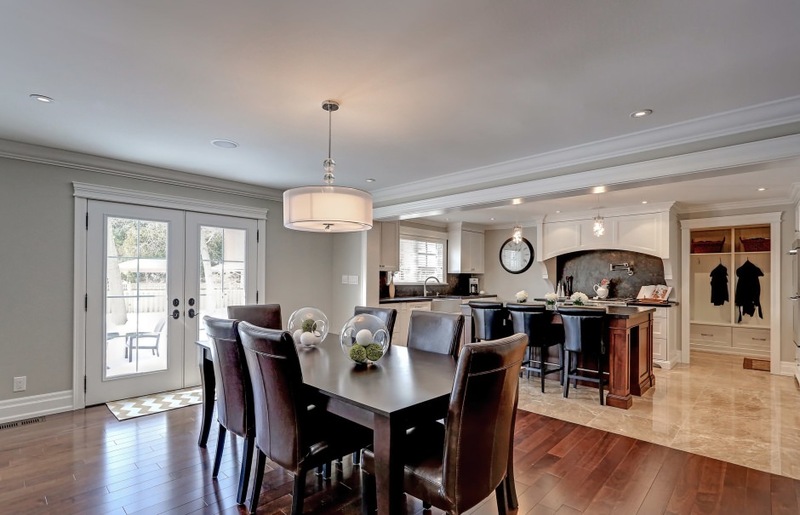 Quality home from top to bottom that offers amazing value in a downtown Oakville neighbourhood!